Although I have no plans to end up there, I can’t help but imagine what sorts of things might be found in hell. I am, of course, familiar with the traditional images of fire, ragged clothing, and stalagmites, but I believe that the more mundane forms of punishment would actually be the worst. I have to assume, for example, that in hell you would never have a full bar of soap, but only aggravatingly small, impossible to hold soap slivers. I suspect that you also would never be able to finish mowing your lawn without it starting to rain. And, I suspect that each resident of hell would have an automatic garage door, but would also be issued a cat that unwittingly trips the sensor beam as the door starts to come down, thereby never allowing you to close your garage door. But, the ultimate perpetual punishment would be that all of the landscaping plants used in hell would be ragweed. This would truly be hell for the millions of Americans who suffer from what is commonly known as hay fever. As you may know, “hay fever” (more correctly known as pollinosis or allergic rhinitis), is a common allergic reaction characterized by sneezing, runny nose, itchy eyes, and a burning sensation of the throat. It is not caused exclusively by hay, but by pollen from any number of different plants that occur naturally this time of year. Pollen is produced by nearly all of the terrestrial plants that we are familiar with. It is produced in the male reproductive structures and then spread from plant to plant to fertilize the female reproductive parts of the plant and produce seed. But it is only certain types of plants that produce allergy-inducing pollen grains. Although the finger of blame for allergies is often pointed at plants with bright and colorful flowers (like goldenrod), these plants are insect-pollinated and have large, waxy pollen grains that are too heavy to travel far enough to cause irritation in a human respiratory tract. Instead, it is the plain-looking plants with barely distinguishable flowers that are the troublemakers. Because their flowers lack color and nectar, they cannot entice insects to transport their pollen from plant to plant. Instead, they depend on the wind to broadcast their pollen, and manufacture prolific numbers of very light and dry pollen granules that can easily remain suspended in the air for hours. 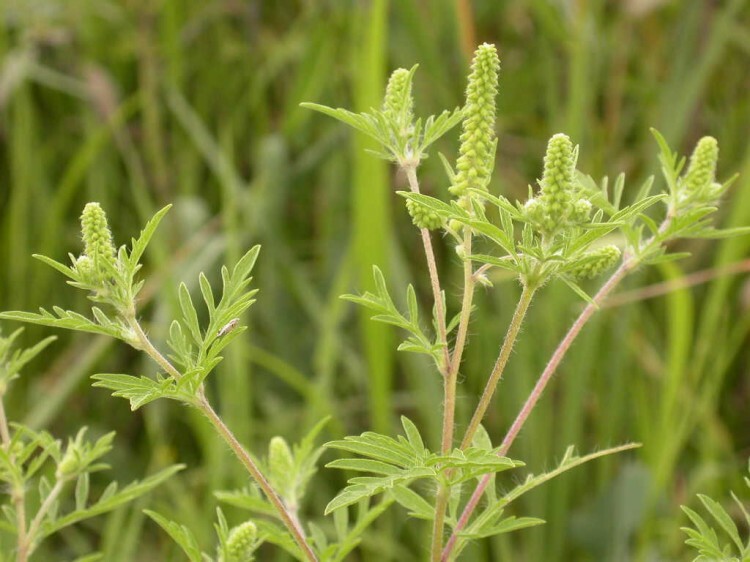 With over 75% of allergy sufferers reacting to it, ragweed is the most troublesome allergy-inducing plant. When it flowers in mid to late summer, a single ragweed plant can produce a million pollen grains per day, many of which will travel hundreds of miles on the wind. There are actually several different species of ragweed, but common ragweed is the most…. well…. common. Common ragweed (Ambrosia artemisiifolia) is named for the raggy carrot-like appearance of its leaves. The leaves of giant ragweed (Ambrosia trifida) are quite different with three main pointed lobes. Although weeds like ragweed produce the majority of allergy pollen, many other plants contribute to the late summer pollen symphony as well. Other broadleaf weeds like pigweed and lamb’s quarters can cause some problems. Only a few species of grass, including Kentucky bluegrass and orchard grass, are prolific allergy pollen producers. And, trees that produce allergy-causing pollen include box elder, oak, ash, pecan, elm, and hickory. The tendency to have hay fever allergies is genetic, but your sensitivity to various types of pollen is often developed from repeated exposure (particularly at times when your immune response is compromised by another ailment). For this reason it is possible for hay fever allergies to mysteriously appear, disappear, and reappear throughout your life. Like all allergies, hay fever is not actually caused by plant pollen, but by your own body’s overreaction to a false alarm. When pollen grains enter the body of an allergic person, his or her immune system falsely treats the pollen as a potentially life-threatening invader, mobilizing various antibodies and launching a chain reaction of defense systems. This would be fine, but many of these defense systems involve the production of chemicals which cause the inflammation, itching, and mucus production that we associate with allergies. But, don’t worry. I’m sure there will be Claritin in hell (it’s just that the bottles will all be empty).